Andrew Schwab and/or fintryqueen.ca will not be held liable for any damages of any kind arising from the use of or inability to use this website. Andrew Schwab and/or fintryqueen.ca will not be held liable for any damages, including and without limitation direct, indirect, incidental, special, punitive or consequential damages, even if formally advised of the possibility of such damages, this includes damages for negligence or gross negligence. You agree to indemnify and hold us harmless from and against any third party claims, liability, damages and costs and included, without limitation, are attorney's fees and/or court costs arising from your use of this site. In addition we are not responsible for the content on any linked site within the fintryqueen.ca website. As a visitor to our website, you acknowledge and agree that any reliance on or use of any information available on this website shall be entirely at your own risk. In no way will Andrew Schwab and/or fintryqueen.ca be liable for any direct, indirect, consequential or exemplary damages arising from the use of or performance of this website. The text and/or photos of this website may change at any time. We offer no warranties as to it's content, claims (historical, present-day or projected) and will not be held liable for any said content or modification of content. 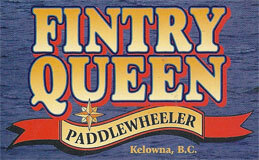 The information included here is informational only and holds no guarantees or warranties as to the past or future performance of the Fintry Queen Vessel as a business.